Something made me head to the Google machine recently and search for private school tuition rates in Michigan. It occurred to me that the daycare we are sending our kids to isn’t really a daycare at all. It’s a private school. It’s still a daycare but its different from the one I went to when I was a kid. My parents dropped me and my brother off and we played. The one we send our kids to teaches and plays. I’m sure the daycare game has changed since the 1980s so I won’t go into the specifics of what goes on at the daycare as that’s not what this article is about. My search for private school tuition rates in Michigan was done because we have grown accustomed to (no we haven’t) the price of daycare and was wondering if it was comparable to a private school. And maybe we could afford to send them to one. Let it be known I puke a little when I know we are spending $11,400 per kid a year for a grand total of $22,800 a year. Just…balls. It appears most of the private schools were high schools and more expensive per year than the daycare. Balls…again. Weaving through the search results I read a comment on a post which is the title of this article. Its one of those times when you read something and it stops you dead in your tracks. You let it sink in, think about it, and move on only to have it pop back into your head ten minutes later. That’s what happened to me and I tried going back to find the comment. Sadly, I could not. Like I said. It got me thinking. Since having kids we have spent an insane amount of money on daycare. My estimates are around $50,000 in three years for two kids. Just…balls. And I know we haven’t been able to save nearly as much as before kids. That $50,000 would have been put into maxing out retirement accounts and after that into a taxable account made up of stocks paying quarterly dividends and an S&P 500 index fund. And that’s just from daycare. I’m not including diapers, formula, clothes, car seats, toys, books, strollers, high chairs, and the other dozen or so things that would never enter your house if you didn’t have kids. Since September 2013 I have been using Mint to track my entire financial picture. All of my credit cards, checking and savings accounts, along with my brokerage accounts are linked there. So I ran some reports to see how much my savings rate has moved since becoming a dad. Sept 2013 to July 2015. Age 33 to 35. Included in “Financial” are deposits made into retirement and taxable investment accounts. Lets say 40% of my income went to investments. Included in “Home” was a major home renovation which I paid cash for. “Home” represents 15% of my income. Lets say 8% went to paying down our mortgage plus half of the remodel costs which should increase the value of the home and the other 7% went towards interest, grass seed, light bulbs, etc. I look at real estate I own and live in as a “neutral” investment. The house appreciated in value but you can’t spend equity and it doesn’t earn dividends. Lets say 40% went into “Financial” plus the “good” 8% from “Home” represents me setting aside 48% of my income in some sort of savings or investments. Not bad. July 2015 to February 2018. Age 35 to 37. “Financial” dropped from 40% to 12%. “Home” went up from 15% to 20% and included another large home remodel project. Lets say 8% went to paying down the mortgage plus half the increase in value of the home due to the remodel. 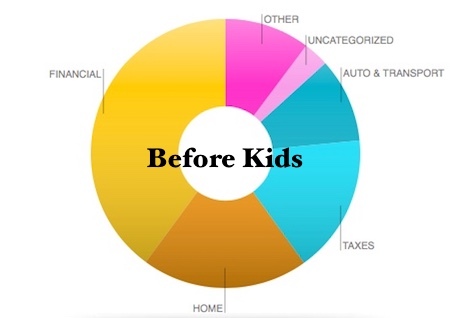 I went from 48% of my income going into savings or investments before kids to 20% after kids. There are people who would say a 20% savings rate is pretty good. I disagree. Notice the new “Kids” section representing 10% of my income. Fun! And taxes (income and property) now represent my #1 expense. Just…balls. These are just my finances. Our son was born in July 2014 and daughter in July 2015. Andrea has a full time job and pays our sons daycare. I pay our daughters. Theres little to show for 2014 in the “Kids” section as I didn’t start paying for daycare until Oct 2015. How many times have you heard parents say “kids will change you”. I think this is more about struggling to grasp your life before kids to now having kids. You don’t realize how over your non-kid life really is. Fast forward a year or two or three and the financial reality of being a parent sets in. I grew up in a household where both parents worked and my brother and I went to daycare. After we spent $22,800 last year just for daycare I can understand why one parent would quit their job and stay home with their kid(s). By the time our kids go to first grade we will have spent $114,000 just on daycare. Just…balls. And sadly, its worth it. Which is for another story. What you don’t see in the report is how my income went down by 40% in those two years. Why? With me being self employed and working from home we decided I would keep our oldest home with me two days a week and send him to daycare three days a week for his first year. I realized quickly I cannot work with a baby at home. They are demanding and exhausting. Doing this saved us some money and he did get used to the daycare. I’m sure it made me a better human being as I know how to take care of a baby on my own. Put that on the resume. Our combined income has been about the same these past five years. Her’s has gone up as mine went down. When we found out we were pregnant again as our son turned 5 months old it was something. We talked about having two kids but the first took longer. Yes – we were a little shocked. And we decided to do the same with our second child as our first. I was going to be staying home with our daughter two days a week as our son transitioned to five days a week when he was a year old. Between juggling two babies and finding out my dad was diagnosed with a disease that would eventually take his life there just wasn’t anytime for work. Basically, I didn’t work for over a year. I just couldn’t. Life needed me. And the daycare didn’t have space for our daughter to go full time until she was sixteen months old. A year of being at home two days a week parenting turned into almost three years. Thankfully I did have income from the business I spent years working but there was no time to build it. So the income dropped. And when you’re not working you can’t save. As we began to share stories of parenting with friends I often hear how one of the parents had to quit their higher paying sales job making $100k a year working 60 hours a week and take another job within the company making $60k a year working 45 hours a week. Only because they have no way to get their kids to daycare or a family members house and they would never see their kid. How are you going to save anything when you’re making $40k less a year and now you have daycare to pay for? And I don’t hear stories about making sacrifices with their lifestyle (cars, trips, etc.) coming up. When I was 19 years old I learned your retirement should be the biggest expense of your life. I was fortunate enough to be told this from my dad and at a summer internship with a stockbroker at Merrill Lynch. So thats what I’ve been doing since then. Saving/Investing half and living off the other half. That is until kids came into our life. As I get used to seeing money going towards our kids its nice to know the money I saved before kids has reached the snowball effect. Basically, the accounts grew in value more last year than I made in income*. 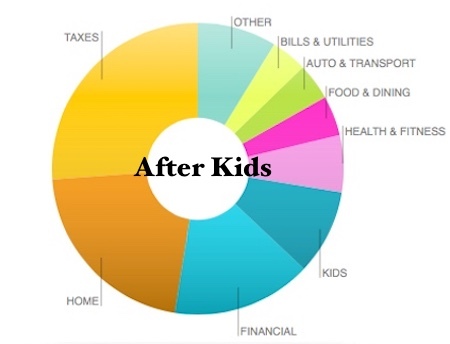 The thought of starting to save for retirement (or anything really) at the age of 37 without kids would be concerning. The thought of being in the same position with a kid on the way would send me from DEFCON 5 to DEFCON 3. I watched my parents save and invest my entire life. And neither of them came from money. What they did do was work their asses off and make sacrifices. Its really the only way to get ahead when you’re not born on 1st or 2nd base. Saving when you have kids can be done but it is so much easier to do when you don’t have them. It just is. I hear from other parents that once they get out of daycare and into school the costs go down and it feels like getting a raise. But man, that comment hit home. Its remarkable how much things have changed with our finances and lives since our kids came around. *I understand 2017 was a crazy good year for the stock market. But even if it went down the mutual funds and stocks I own historically pay dividends which I re-invest. So I would have got shares on the cheap.